The Kindness of Strangers – Patrick F. Clarkin, Ph.D. Under these — somewhat arbitrary — conditions, the best individual outcome one could hope for when interacting with their partner would be to get the maximum of 5 points. However, the best collective decision would be for both to get 3 points each (or 6 points total for both partners). Mathematically then, the inherent dilemma is whether one should strive to do what is best for oneself or what is best for the collective, all the while not knowing whether to trust one’s partner. When the exercise is over, I collect the students’ data sheets which recorded their interactions over multiple rounds and the points they accumulated. I’ll skip over some details, but I wanted to focus on one pattern I found. Generally speaking, the total number of points a person earned was MUCH better correlated with what their partners did than with what they did. 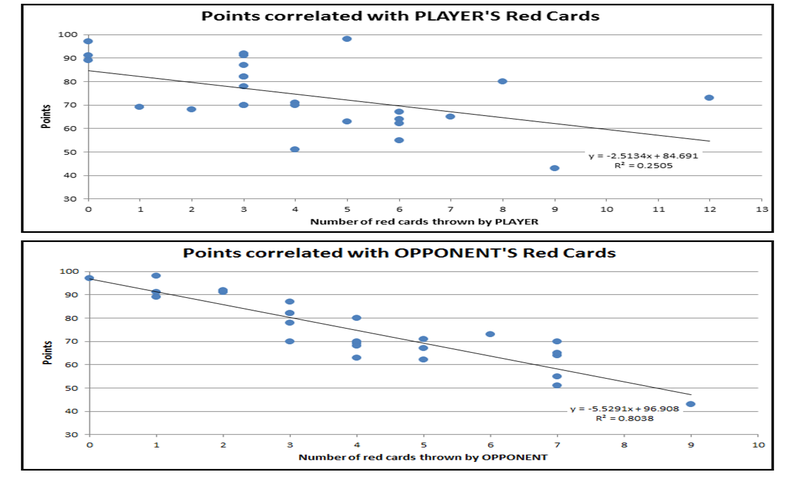 The graphs below show the total number of points correlated with the number of red cards (defections) that a student threw, as well as the number of red cards that their various partners (or opponents) threw against them. In other words, there is a lot of luck involved. Perhaps ‘luck’ isn’t the best word. Instead, we can say that the outcome of our interactions is contingent on others’ choices, and that the locus of control is not completely within ourselves. We are not completely master’s of our own fate. I’ve done this exercise with several classes, and this pattern is very consistent, so this was not just an aberration. We also look at the results as a class and then discuss students’ strategies and motives while the game was underway. Some say that they made a choice to defect at the beginning of the game to avoid being taken advantage of. Others try to read their partners’ faces to predict whether they look trustworthy or not. Still others have no strategy and choose almost randomly. Finally, some wish to establish a reputation as a kind cooperator for the rest of the semester, even if it costs them points and a chance at the prize. This is just a classroom exercise, and I don’t want to reach too far in looking for lessons that apply to the larger world. Yet, I see parallels in that we are always somewhat dependent on the kindness of strangers (and kith and kin), regardless of our own disposition as cooperators or defectors. Ideally, we’d like to find ourselves in a population of cooperators, but we also know that there is always the chance of meeting up with someone unwilling to reciprocate. Therefore, it may be necessary to remain guarded. For example, we may prefer a life of quiet and peace. But that peace can be easily shattered by someone who crashes, uninvited, into our lives — a bully, a hopeful conqueror, or even an otherwise good person who has fallen prey to fear and distrust. The tricky part is to decide how much to trust, and how guarded we should be. That probably depends on the average tendency of a population to cooperate or defect, as well as our own — imperfect — perceptions of what that tendency really is. But we also know that tendency can fluctuate over time. It is also altered by our own choices because we are, of course, a data-point in the population we live in as well. Fear and distrust can be understandable emotions, and defection a rational choice. But over the long-term they reinforce each other, costing us ‘points,’ dollars, stress, health, and happiness. 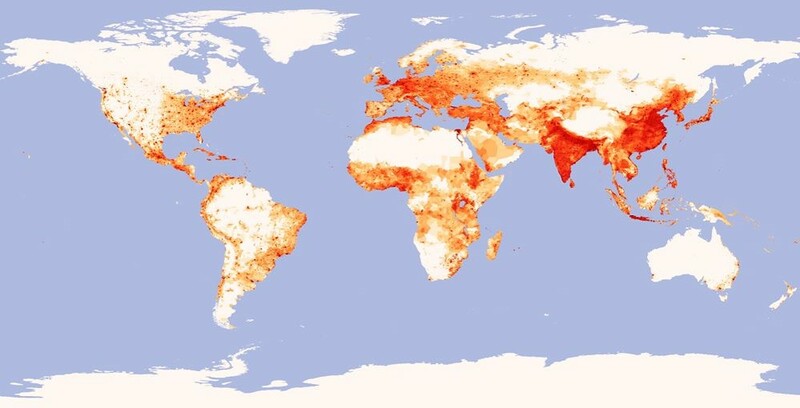 World population, or where the humans live. There are hopeful signs that, overall, we prefer cooperation over defection. One obvious example is that fact that we are an obligatorily social species. People everywhere live in bands, tribes, villages, or mega-cities, strongly suggesting that we must get something out of being near each other, whether it be protection through strength in numbers, or the economic benefits that accompany specialization and trade. To return to Eric Johnson’s article, he wrote that in actual trials of the prisoner’s dilemma scenario, “people were much more likely to cooperate than would be expected under the assumption of rational self-interest. Cooperation and altruism seem to be innate characteristics of the human species.” Living in an endless cycle of distrust among a population of defectors seems too big a burden to bear. Luckily, we are surrounded by kind, cooperative people as well. Lots of them. Repeated interactions. When we interact repeatedly with the same person, rather than a one-time thing, we may choose cooperation in order to ensure cooperation (and avoid defection against us) in the future. Reputation. If people can observe our behavior, we have an incentive to earn a reputation as a cooperator to increase the odds that others will want to cooperate with us in the future. Partner choice. For those with reputations as non-cooperators, people may choose to avoid them altogether. While the kindness of strangers is not completely within our control, we can also remember that we are also strangers to others. To them, it is our own willingness to cooperate that is out of their control. When two strangers let their guard down and see through possible distrust, good things can happen. This entry was posted in anthropology, Cooperation and conflict and tagged David Rand, Eric M Johnson, Prisoner's dilemma. Bookmark the permalink. “The head ones to whom we look in confidence” is how the Iroquois express [the reciprocal relationship between leader and follower]. The equable person is the ideal leader, one who consults his colleagues and the people, and operates by consent. He never bosses or orders anyone around. His great prestige, occasionally translated into joint action with fellow leaders, constitutes a kind of diffuse power. Interesting. I think you’re right – they’re different models. Forced cooperation through threat of punishment is one way to go, and can be very effective, but it also seems less ‘authentic’ to me than a system which requires continuous negotiation. The whole is greater than the sum of its parts, or 2 + 2 = 5. Anyway, to corroborate this, my mom also thinks I’m nice. Two data points equal a trend, right?